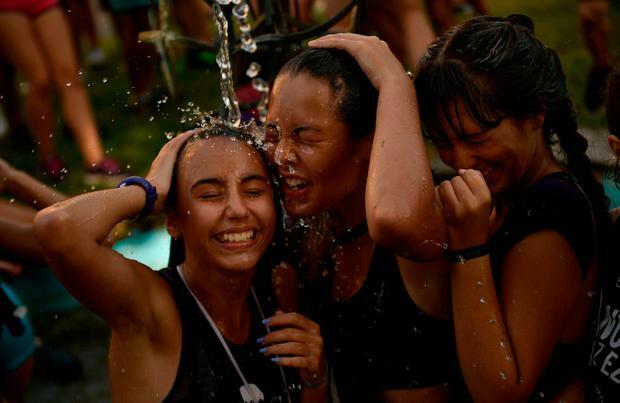 Lisbon has broken a 37-year-old record to notch its hottest temperature ever as an unrelenting heatwave bakes Portugal and neighbouring Spain. Portugal’s weather service said the capital reached 44C (111.2F) on Saturday, surpassing the city’s previous record of 43C (109.4F) set in 1981. The day’s hottest temperature of 46.8C (116.2F) was recorded at Alvega in the centre of Portugal. The country’s highest temperature on record is 47.4C (117.3F) from 2003. The hot, dusty conditions across the Iberian Peninsula are the result of a mass of hot air from Africa. France has been forced to temporarily shut down four nuclear reactors as soaring temperatures hit the region, energy company EDF said. The company halted a reactor at Fessenheim – the country’s oldest nuclear power plant – in eastern France, in order to keep the plant from overheating the nearby river. It had already shut down three other power plants near the Rhine and Rhone rivers for similar reasons earlier this week. The power plants use water from the rivers to cool down their reactors, before sending the water back into the rivers. Overheated waters can result in mass fish die-offs, like those that occurred in Germany this week. The shutdowns are just the latest inconvenience in the heat wave that has descended on much of Europe in recent weeks. A drought sweeping Switzerland has left herds of cows stranded without water. The country’s helicopter association and Air Force have been called to transport tens of thousands of gallons of water every week to sustain them.